5 volumes. Folio. Ad 1 bound in modern half sheepskin, gold-tooled spine, with the original publisher's blue printed paper wrappers bound in. Ad 2 and 3: red half cloth. 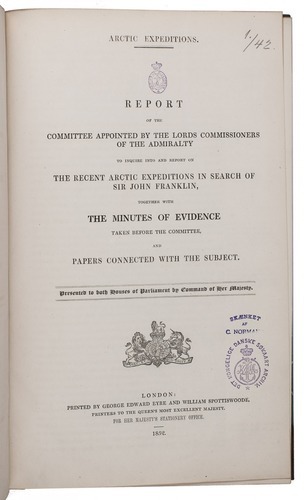 Ad 1: Official report of the committee appointed to deal with the expeditions in search of the British Royal Navy officer and explorer John Franklin (1786-1847) "and whether everything was done by them to carry into effect their instructions, ..." (p. III). 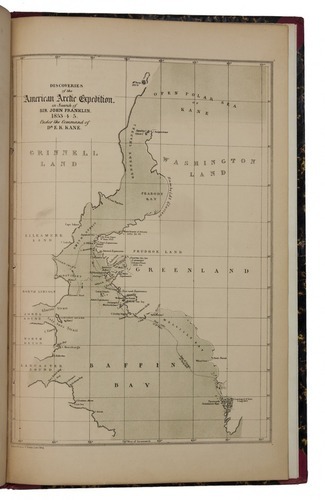 After earlier expeditions to the North Pole and arctic Canada in the 1820s, John Franklin left Britain again in 1845 in search of a northwest passage: "His instructions were simple; he was to sail as far west as possible, to about 95°, then penetrate southward and westward towards the Bering Strait. 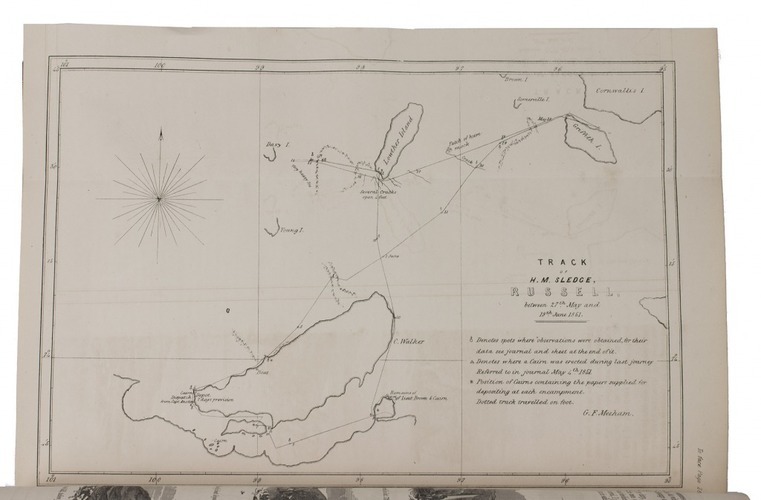 If such a route was found impossible he should go north through the Wellington Channel, ... and seek an alternative passage in that direction" (Howgego). The two ships got stuck in ice near King William Island in September 1846, where Franklin died in June 1847. Still trapped in ice, the remaining crew abandoned the ships in April 1848; the entire party perished. 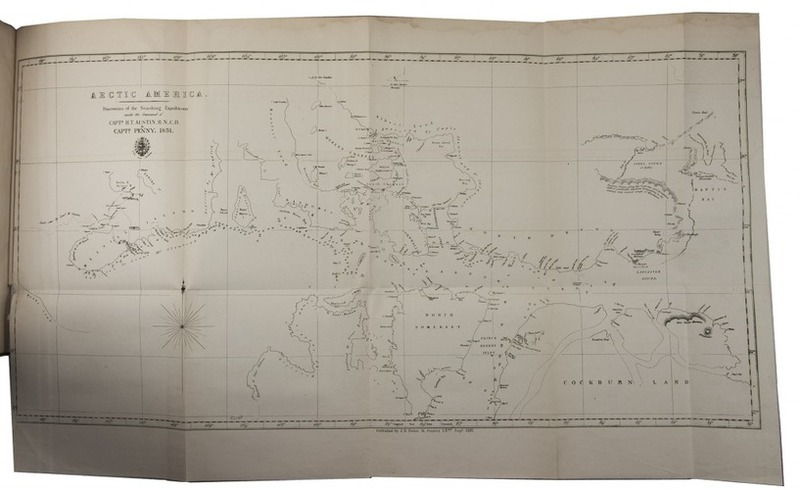 Many expeditions in search of Franklin and his crew followed, starting in 1848, most of them initiated by the Admiralty. 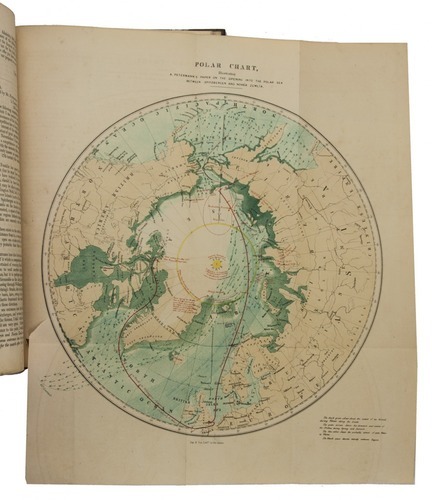 The present publication deals with the two major expeditions of 1850. 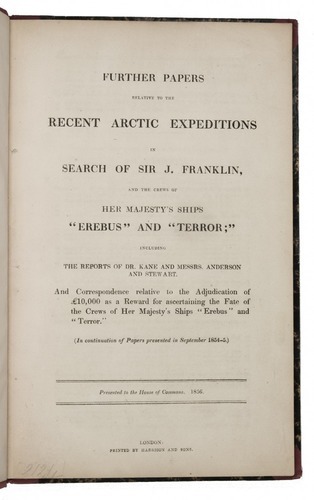 The first volume "contains results of an inquiry by the Arctic Committee into the thoroughness of Austin's and Penny's search for Franklin..., dealing specifically with ice and current conditions in Wellington and Queens Channels and with the discovery of relics of the Franklin expedition in the vicinity of Beechey Island" (Arctic bibl.). 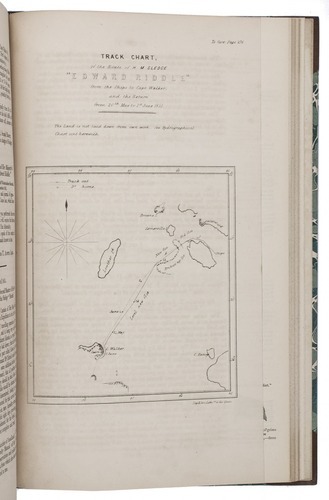 It contains numerous letters to and from the captains of these expeditions, Captain Austin and Captain Penny, as well as interviews with them and members of their crew.The second and third volumes describe the two search expeditions, whose captains kept in contact with each other during their journey. 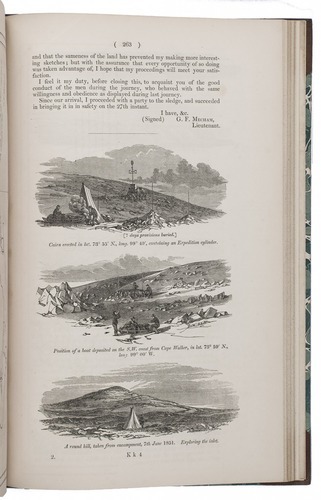 The volumes contain numerous letters by both captains, as well as valuable day by day journals of their proceedings. 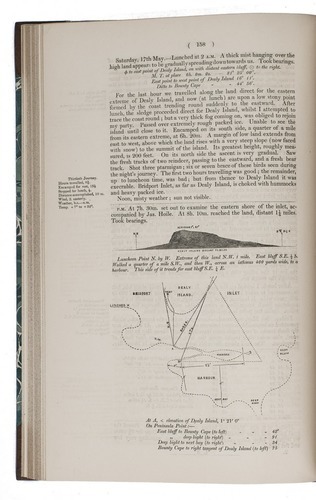 Included in the text are illustrations of coast lines and flags and a few tiny maps. Most of the maps are included on plates (some folding), showing the journey of the two expeditions and newly mapped areas. The third volume is often considered the most valuable, since it contains new information acquired by the above mentioned expeditions but also others, including Richard Collinson's expedition to the Bering Strait. Austin and Penny found out that Franklin's party had wintered at Beechey Island in 1845-1846. It wasn't until 1857 that another expedition financed by Franklin's widow found skeletal remains and the crew's reports up to April 1848 were found King William Island. 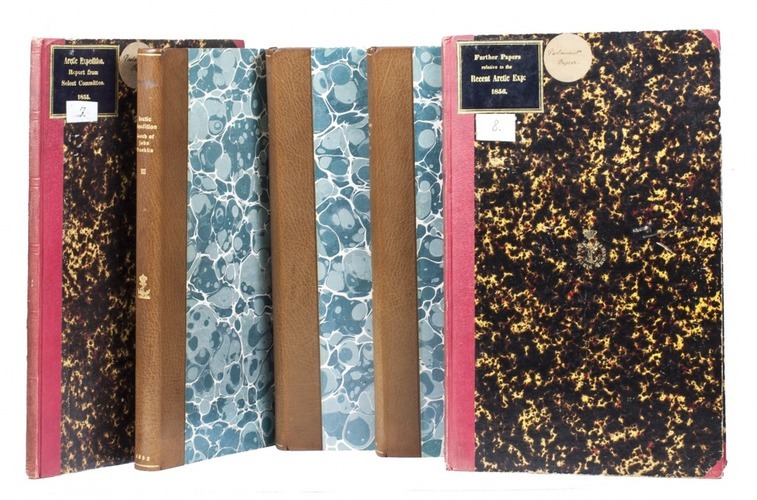 The present publication as well as other similar publications on Arctic expeditions were initiated by the British Parliament and became known as the Arctic Blue Books, after their dark blue paper wrappers. These documents are "largely field records of participants in the expeditions or their evidence of hearings etc., and record their activities and the regions explored in more explicit detail than the narratives and scientific papers of these expeditions published for the general public. 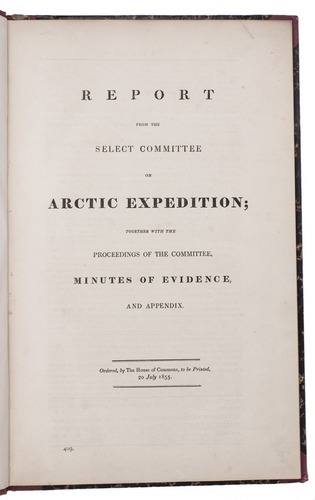 For a large part of the Canadian Arctic, they have been the most extensive source of information in print, and for sections of it, until recently, the sole source" (Arctic bibl).Ad 2: Official report of the Arctic expedition-committee, dealing, among other things, with the expedition by Robert McClure (1807-1873). McClure embarked on a new Arctic expedition in search of Franklin and a northwest passage in 1850. The ships did find what they called a northwest passage, though ice made it impossible to navigate, but the committee nevertheless rewarded McClure with £5000 and another £5000 for the ship's officers and crew. There was no true northwest passage to find before the recent global warming. The report closes by paying respects to John Franklin, emphasizing that the search for Franklin and his crew were the main goal and that the northwest passage was discovered "incidentally". 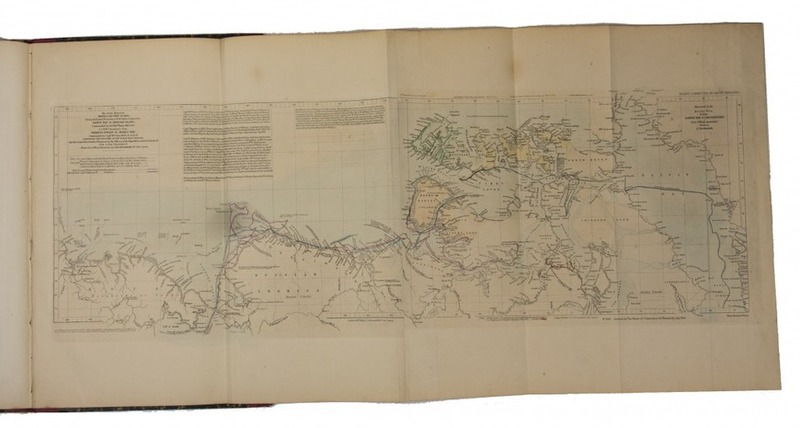 Other sections deal with the travels of Captain Richard Collinson and Captain Henry Kellett. The folding map shows the routes taken by McClure and Collinson. 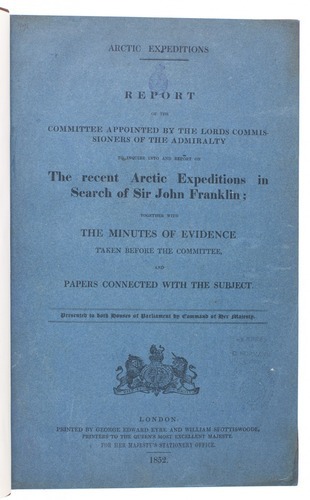 Ad 3: Further papers dealing with the ongoing search for John Franklin and his crew, issued by the Arctic exploration-committee and presented to the House of Commons. It narrates the proceedings of several search parties, including American and Canadian expeditions like the Second Grinnell Expedition (under command of Dr Kane) and also the Hudson Bay Company’s expedition (under Anderson and Stewart). It also contains the correspondence concerning the adjudication of the £10.000 to the Scottish explorer John Rae for finding out Franklin's fate. Ad 2 with an occasional marginal note in pencil. Ad 1: In very good condition, only slightly browned and with small tears in the margins of a few folding maps; ad 2: slightly browned; ad 3: slightly browned, with a tear at the foot of page 41. Overall a very good set. Ad 1: Arctic bibl. 45227, 45228, 45229, see also p. 317; Howgego, 1800-1850, F21 and F22; G. Walpole, Relics of the Franklin expedition, p. 223; ad 2: Arctic bibl. 45248; ad 3: Arctic bibl. 45249.